For our recent honeymoon trip, my wife gave me an extra surprise. Our honeymoon took us to Disneyland for what we named The Epic Disneyland Honeymoon. And it was epic, especially since we were there right at the beginning of their Christmas season programing. But this was not the surprise she had for me. No, the surprise was a special VIP tour of Universal Studios. I had been to Universal Studios Hollywood several times, and even been to Orlando once; these trips were done as the normal entry in the park that everyone takes, with the rides and the famous tram tour of the back lot. 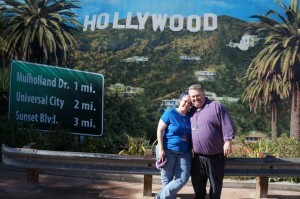 But this was different, this was the Universal Studios Hollywood VIP Experience. It cost nearly $300.00 per person special ticket. It is red carpet treatment and makes you feel like a big shot. If you have followed this site for a while, it will be no surprise that I am a huge Universal fan. My favorite movie of all time is Universal’s Casablanca, and my love of Universal Horror is well documented. Of course the woman I married is well aware of this love of all things Universal. Thanks to this, she felt it was worth the money to make sure that our Honeymoon would have an event that would have special meaning for me. If you share this love of Universal, or really just movies in general, it is something you may want to consider sometime. Now when I say ‘surprise’ I want to be clear that I knew about it before we got on the airplane; she didn’t just spring it on me that morning, which is a good thing because we needed an early start. Staying at the Disneyland Hotel meant we needed a rental car, and fortunately Downtown Disney has a car rental place onsite. This was important because the VIP tour has a specific start time, which meant that taking the shuttle was not optional. We got an early enough start that, even with Los Angeles traffic, we got there with 20 minutes to spare. Basically, you need to be there prior to park opening. Valet parking was part of the package, and once we were parked we made our way through the Universal Citywalk to the Front Entrance of the park, checking in at the special VIP entrance to the park. The tour is not something you can just sign up for on the spur of the moment; with limited space each day, you must reserve your space in advance. At check-in were given our special VIP badges, and then we were taken into the not-yet-opened park and escorted to the VIP lounge. Walking through a theme park, which you have visited several times, before it is opened is a very surreal experience; it was really the perfect start to a day full of surreal experiences. The VIP Lounge is a somewhat non-descript building in the middle of the upper level of the park. It is like a small but very nice restaurant. We were greeted at the door and escorted to the patio where pastries, fruit, and drinks were available. There were two tour groups on the patio, each group consisting of 12 people. We were told our tour guide’s name was Matthew and that he would come to collect us soon. The first group left a few minutes before Matthew came to collect us. He was a 20 year veteran of Universal Studios, having worked both in the park and on some extra gigs around the studios. He was a great host, which I assume is a job requirement for leading the VIP tour; it was clear that he knew everyone in the park, and had developed relationships with them. The first part of the tour consisted of going on the rides. As a VIP tour we did not go through the regular entrances; instead Matthew would take us through side entrances and to the front of the line for every ride. He also told us that, after the tour was done, our badges would still get us front of the line access. We started on the Simpsons ride, on the upper level. From there we went to the lower level for the Mummy and Transformer rides. Jurassic Park was closed that day for maintenance. From there it was back up top to the Terminator 2 3D show (this attraction was really showing its age). Matthew told us that it was the last month of the show before it would be closed down and replaced with a Despicable Me attraction. He then took us back to the VIP lounge for a gourmet lunch buffet (which was delicious). After lunch, we went through the Universal House of Horrors attraction, their year round haunted house. Next was the center piece of the whole tour: the back lot tram ride. The normal tram tour is done in a large multi-car tram that holds an enormous number of people; since our tour group was only 12 people, obviously we would not need that. Instead we got on a small tram that reminded me of a trolley. For the most part, the tram tour was the same as the normal one, going through the backlot, discussing Universal’s history, and having staged events like a flash flood or the encounter with King Kong. But there was more to it; the normal Tram tour is around 45 minutes, whereas ours was over 2 hours. That extra time was spent doing things that made the whole trip worthwhile. Some of it was simple; since our tram was small, we were able to go places the big trams couldn’t. So we got to see where the sound stages for a lot of shows were. We passed by the CSI sets, which had their doors open a bit, although all we could see were the backs of sets. Right after that was the first thing that made the VIP tour stand out: our tram pulled up to a sound stage and stopped, Matthew had us get out of the tram and check in with a security guard after which we were taken into the sound stage. It was the set for a TV show called Parenthood, specifically a house set. I’ll be honest I have never watched this show, but that didn’t matter, this was a working TV set and we were being allowed to go in and see how it was set up and what they do to shoot the show there. Matthew went over various technical details of the set, describing how things are constructed in order to film the series, including the lack of a ceiling on the house to make room for lighting, the trees outside on wheels and the backdrop. I found myself focusing on details, like the books on the shelves. From there it was more tram tour, including the city street sets. We got lucky, and in the distance we could see a scene for CSI being filmed, my wife was very excited when she spotted Ted Danson on the set. The next special treat was another stop. We parked outside of a very non-descript building and took an elevator to the top floor. This building held the Universal Wardrobe and Props departments; each of these departments is the biggest, of their kind, in Hollywood. Matthew pointed out that anyone can rent from them, even members of the public. The building was really just a normal warehouse with some offices. It was not glitzy, until you paid attention to what was stored there. 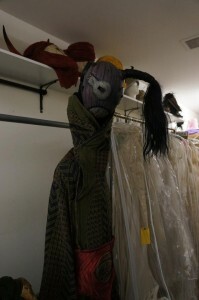 When Universal makes a costume for a movie or TV show, they take it back when they are done and add it to their wardrobe inventory for rental. An example is that the battle armor from Starship Troopers was reused for the show Firefly. There were racks of clothes of all types. One row was ball gowns, another was chainmail, both fake and real, yet another was a whole row of Santa Claus outfits. At one point we stopped while Matthew checked to see if we could go into the next room; the costumes we stopped by were from Hellboy 2, and my inner fanboy rejoiced. Down one floor was the props department, which is really just one big warehouse. At first glance it would not seem terribly exciting, unless you really paid attention. The first thing we saw was an aisle of nothing but lamps, but right next to it was a rack of disco balls, then a row of telephones arranged by date (oldest to newest), followed by a row of body parts. Matthew explained that prop masters from different productions would come in with slips containing details about the production company, and the dates various props were needed; they would go through the department and if they came to something they needed they would tag it, marking it as reserved for them, and the department would record who was taking what. The production company would be responsible for collecting the props they needed on check-out day. 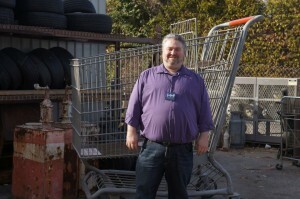 During our visit, several people were loading carts with props. Some of the props were just for display, as they were too iconic for use in other productions, such as the dagger from the Shadow. While we weren’t supposed to touch anything, Matthew did take us to one spot where we could. These were demo props for the tour, designed to look dangerous but be safe (for example, a foam frying pan painted to look real that he let my wife whack me over the head with). We also got to play with breakaway glass. Going down a couple of flights of stairs (and I assume skipping a couple of floors of props) we were at ground level where they have larger props like furniture, statues, phone booths, and a giant shopping cart from Jackass. Back on the tram, we passed the Jaws set, the Bates Motel with an actor playing Norman, and the Bates House. Beyond the Bates House was the crashed airplane set from Steven Spielberg’s War of the Worlds. The Tram stopped here and we were let out again; we were allowed to walk around the crash set, take pictures, and even touch some stuff. (Interesting note – the Station 2 set from Jurassic Park is hidden behind the crash set.) After that it was back on the Tram to finish up that tour. Returning to the park proper, we went to the special effects show where we had VIP seating. After that, we were taken to the Water World Stunt Show where, again, we had VIP seating. It was here that Matthew said goodbye, as this was the end of the tour. After the Stunt Show we had one last treat, a Q & A with a pair of the stunt performers. And with that, we had about 20 minutes left for shopping before the park closed. So I would definitely recommend this. The first part is fun, if you are a theme park fan. The second half is an absolute blast if you are a film or TV fan, especially if you have an interest in how things work behind the scenes. The food in the gourmet lunch is excellent, and the tour guide and all the staff went out of their way to make sure we felt special. At times it felt more like a friend sneaking us in the back entrance than going into a priority line, and I mean that in the best ways. If you have a chance to go to Universal Studios and you can afford it, I would highly recommend getting the VIP package. 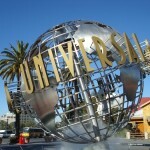 This entry was posted in Review and tagged Hellboy, review, Theme Park, Tram, Universal Studios, VIP Tour by Caliban. Bookmark the permalink. All kinds of jelly-Jealous! I think I've been to both parks twice, but never on such an extended and in depth tour. Sounds like you had a great time!